Tap into your inner dystopian to imagine dark designs. With this tool you’ll use role-playing and humor to open up new possibilities. Act out design ideas to experience the ethical implications yourself. It will help you develop your design further and allows for discussion within the team. 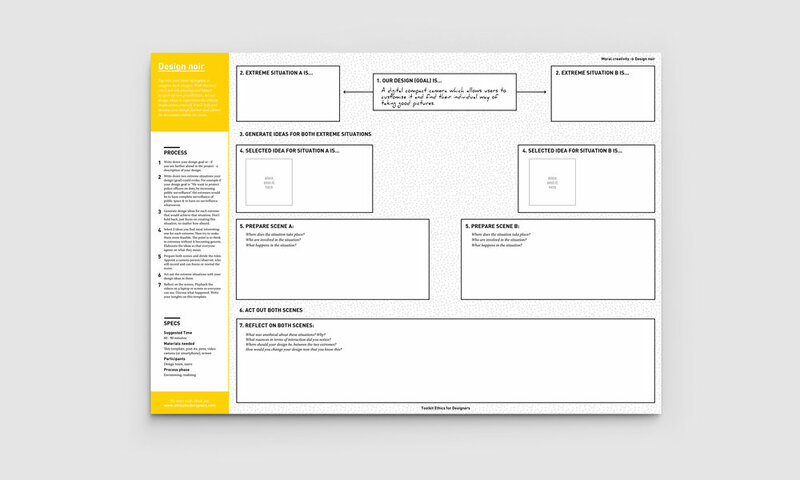 The design noir tool consists of 7 steps. Note down your design goal. Think of two opposing extreme situations. Generate ideas for each extreme situation. Select one idea for each extreme situation. Prepare the scenes you will role-play. Act out both scenes, record them and reflect on what happened using the questions on the template. Write down your design goal or - if you are further ahead in the project - a description of your design. Write down two extreme situations your design (goal) could evoke. For example if your design goal is “We want to protect police officers on duty, by increasing public surveillance” the extremes would be to have complete surveillance of public space & to have no surveillance whatsoever. Generate design ideas for each extreme that would achieve that situation. Don’t hold back, just focus on creating this situation, no matter how absurd. Select 2 ideas you find most interesting: one for each extreme. Then try to make them more feasible. The point is to think in extremes without it becoming generic. Elaborate the ideas so that everyone agrees on what they mean. Prepare both scenes and divide the roles. Appoint a camera-person/observer, who will record and can freeze or rewind the scene. Act out the extreme situations with your design ideas in them. Reflect on the scenes. Playback the videos on a laptop or screen so everyone can see. Discuss what happened. Write your insights on this template.